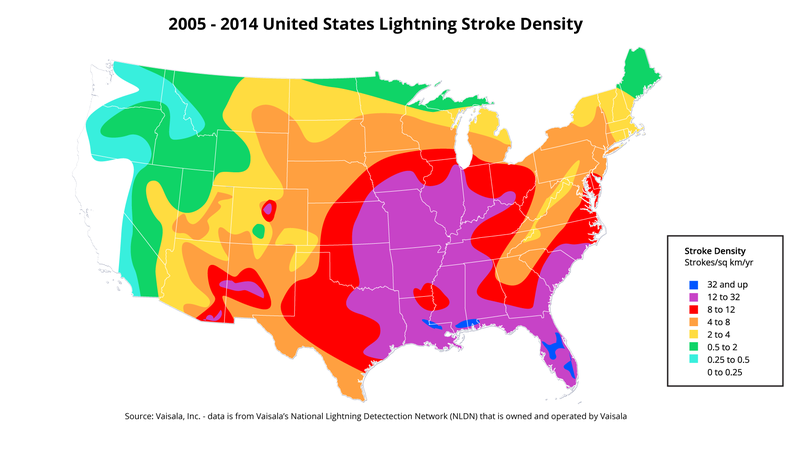 Horses living in regions with high flash or stroke densities are more likely to get struck by lightning then those that aren't. In the United States, these areas predominately include the southeast (especially Florida), Gulf States, the Mississippi and Ohio River Valleys, the Front Range of the Rocky Mountains, and some other mountains in the Desert Southwest. 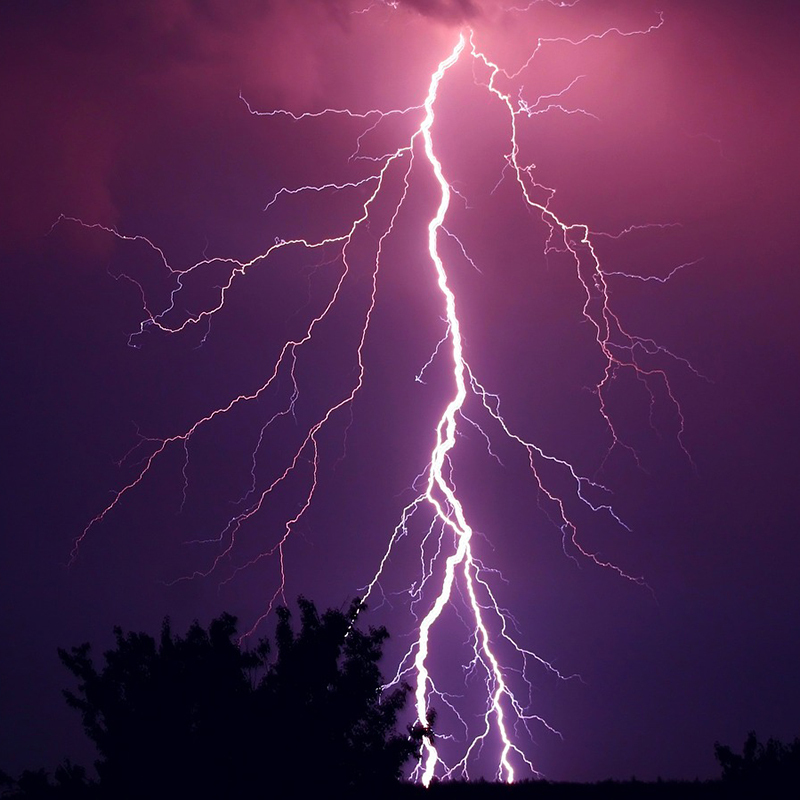 Lightning is caused by an imbalance of positive and negative charges in the atmosphere. During a storm, negative charges are generated along the bottoms of clouds. Positive charges are generated on buildings, trees, or any objects that protrude upwards from ground level. As both these charges increase, once they reach high enough levels, it causes a streamer of negative charges to move erratically in the direction of the earth. At the same time, a short leader of positive charges may move a short distance upwards into the air. Once the two charges meet, the negatively-charged streamer from the clouds completes it's grounding path as the positive charges move upwards along the same path, and into the clouds. Any trees, buildings, or other objects that are tall and isolated, tend to generate more positive charges. Therefore, pastures that are hilly, contain isolated tall trees, buildings or other objects, are more at risk of getting struck by lightning. 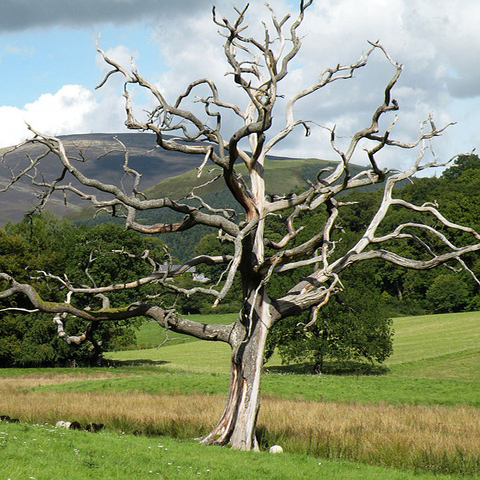 The taller and more isolated the tree, the more it's at risk of getting struck by lightning. 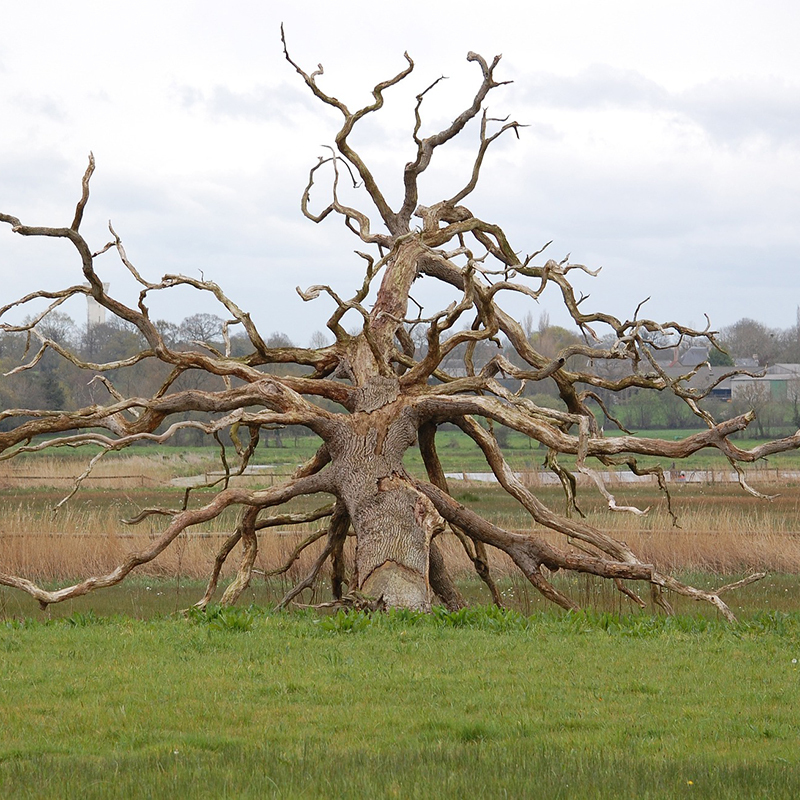 Also, certain trees are more susceptible to lightning strikes than others. These trees should be identified and either protected or removed from pastures where horses are turned out into. Ground current: Ground current strikes occur when lightning hits the ground, causing the current (often 20,000+ amperes worth) to spread out along soil surface, including any obstacles (such as horses) that may be in the vicinity. For a horse standing on the ground affected by the current, it can travel up a hind legs, through it's entire body and down the front legs. Along the way, it can potentially stop the horse's heart or arrest it's breathing. The greater the space between where the current enters the horse's body and where it leaves, the greater the potential for serious damage. Side flash: Side flash occurs because lightning follows the path with the least resistance to electrical current to the ground. If a horse is standing underneath a tree that is struck by lightning, the lightning is more likely to jump from the tree to the horse. So one lightning strike to a tree or a strike to the ground can jump back and forth among all the animals nearby. 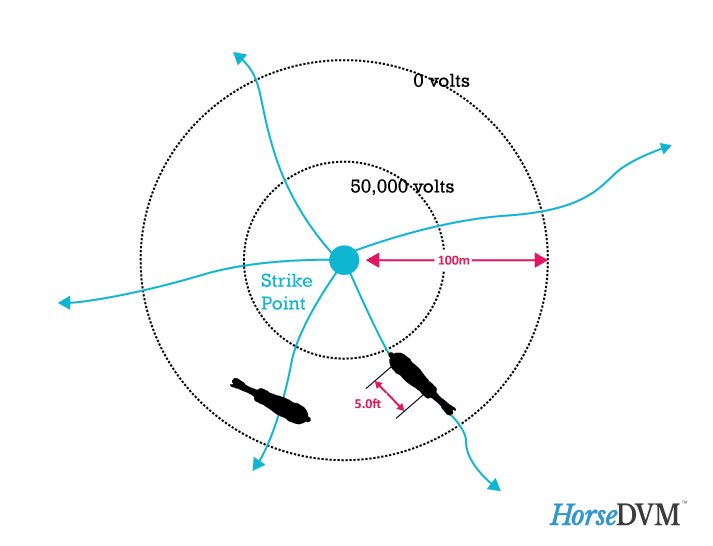 Contact strike: Occurs when a horse is touching an object that is in the pathway of the lightning current, such as if it hits a water trough or electric fence. Any electrical fences installed should be grounded and its electrical continuity should be broken by insulation material in brakes in the wires at particular calculated intervals per manufacturers recommendation.